Putting herself in an unfamiliar learning setting, Christiane Dufour experienced first-hand what happens in the “making” process when one is unfamiliar with the materials and the techniques associated with them. It brought home what three teachers discovered when they implemented STEAM the Kindergarten Way through Play. Be sure to scroll all the way down to the video at the end. I have a confession to make: I envy the creativity and ability of those who can imagine something and then give form to it. 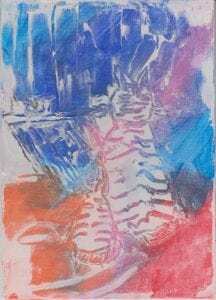 Whether they draw it or make it, it seems to spring easily from within to be translated into the medium of their choosing. That’s an illusion of course: they learned their craft through a lot of experimentation over time. I’ve never experienced that apparent ease. But, as a teacher, I must and do believe that you can learn anything when you set your heart to it. 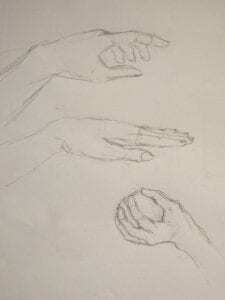 So, listening to the admonitions of the adage that you’re never too old to learn, I decided to take art classes, starting with learning how to draw. Pencils and paper; lots of paper and a good assortment of pencils! I’m in familiar territory. The teacher is great, creative. He has a road map in his head but many ways to take us along. He listens, adapts to our abilities and interests. 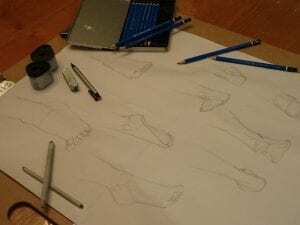 I’m learning to draw, to manipulate these familiar pencils along with a few other simple tools to create the effects I see in my head or in the models he gives us to reproduce or to inspire us. Every week, he enriches our toolkit of gestures and expands our capabilities by building on the previous lessons. When he shows us a technique or corrects our work, he tells us what he is doing and, while doing that, he provides us with a language for shapes, forms, gestures, tools, space and more. All good! I’m still in friendly territory. I see where this is going and, more and more, I imagine things that I could do along with an ever greater variety of ways to do them. I think my drawings are sometimes quite nice. It feels good. 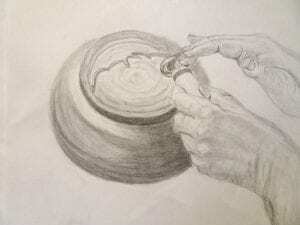 After weeks of learning all kinds of techniques and eventually practicing how to draw hands in all sorts of positions, the potter’s hands emerged from my page by bringing together many of these techniques. Then he throws us (me!) for a loop. He says he’ll show us a technique that will allow us to marry drawing and painting. This time, he proceeds with the lesson in steps. Apply paint to this canvas. (Voice in my head: is any particular way better than another?) Now wait to let it dry. This is not the end of the process; there will be a few other steps to the finished product but I don’t yet know what they are. So I draw the way I do with pencils: lines to create a shape and a few details to give it volume. It doesn’t look like anything I can relate to! I can’t imagine what this will end up looking like. I can’t even think of other things I could do that would give an interesting effect. It just looks like a mess! I have no idea what I’m doing with these materials! This is an “ah ha!” moment for me. I feel lost. I can’t even imagine what I could do because these materials are so unfamiliar. I don’t know what they will let me create. And, there and then, I’m brought back to what we discovered in our STEAM in K one-year experimentation. Namely, how important it is for children to be given ample time to play with and explore materials, tools and techniques freely and with no end-product in mind. Well, this doesn’t apply just to preschool children, does it? It certainly applied to me! And it’s true for any learner at any level. It‘s true also for anything we learn, from art to coding and for all the other letters in STEAM. 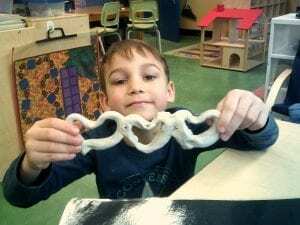 In our year-long project in which three experienced teachers implemented STEAM in Kindergarten, this fact was spectacularly brought home the day clay was introduced in the class. It was a totally new and unfamiliar medium which just shouted to be explored. Their exploration started with the medium itself. How does it feel? How does it let itself be manipulated? What different gestures can be used to shape it? What can be done with these shapes? Then, what tools can be used to refine manipulation? How do you change its texture? How do you stick pieces together? And so much more! 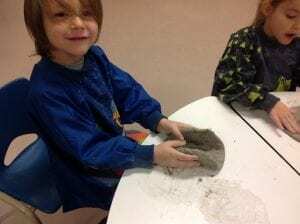 After having played with clay in many ways and used different tools and techniques over several sessions, the children discovered how this material works and what they could do with the tools. It also gave the teachers time to provide them with the language associated with this medium, the vocabulary of clay, its tools and gestures. Having worked with it many times with no particular goal in mind, the children were finally able to imagine what they would like to MAKE with it AND they were able shape their idea into the clay and obtain an intentional result. The lesson I draw from this experience is that when we are introduced to new, unfamiliar materials, practices or techniques, we need to be given the opportunity to explore the potential of the materials multiple times before we make something with it whether it be a picture, a “thing”, or a program. I am reminded that when we observe children inventing and making things with wooden blocks, with LEGO or with cardboard boxes, we tend to forget that they are quite familiar with these materials which have been part of their environment since daycare. They can turn them into any number of wondrous creations or use them in unsuspected ways to serve their goals. Add a few new materials into the mix, such as cars, balls, PVC pipes or cardboard tubes, tape, and they will be able to imagine new things to do and to make. Without that, we are only following instructions without much understanding or transferable learning, very much like I experienced in my fateful lesson. Familiarity breeds creativity as well as proficiency. Observe the exploration and creativity that is possible when Kindergarten students familiarize themselves with new materials without having to worry about creating a single product. Favourite line: “I don’t know what they will let me create.” I can identify with this as a math teacher as well! There are plenty of new tools that I feel that way about. For example the microbit makes me think “I don’t know what to do with this but I’m pretty sure it’ll be cool.” And the only way to figure it out is to play, with no particular goal in mind other than to see what it can do. Lovely post as usual Christiane!